I know what you're thinking. "Wow Jessica, we've never known you to have such a nice looking picture of your food on your blog." Confession: I got this picture straight off the Betty Crocker website...which is where I got this recipe. Although (of course) I have adapted it slightly. Their picture just looked so much nicer than mine. Anyway, try these...they are EASY and DELICIOUS! Mix soup and enchilada sauce in a bowl. In separate bowl, combine 1 cup soup mixture with chicken, corn, mexican blend cheese and 1/2 c. pepper jack cheese. Spray 9x13 pan with Pam. Spread a little soup mixture on the bottom of the pan. 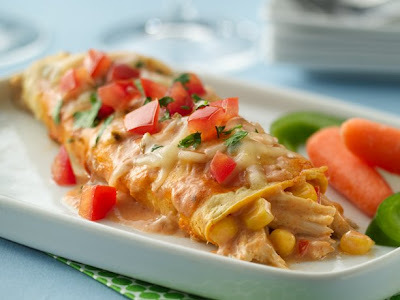 Place chicken mixture in tortillas and roll up. Place in pan. Pour remaining soup mixture over the top, and finish with remaining 1 1/2 c. pepper jack cheese. Bake on 350 for 25-30 minutes. If desired, garnish with salsa, tomatoes, lettuce, cilantro, etc. Note: These turn out a tiny bit spicy due to the pepper jack cheese. However, I am a baby when it comes to spicy food, and I was okay with these. If you really don't like spicy foods at all, you could try less pepper jack and more mexican blend cheese. You don't want to get rid of the pepper jack though, because it adds great flavor! Enjoy! To be honest with you, I really am not a fan of chicken tortilla soup...until now. This recipe is a life changer :). In fact, I just shared it with a group of women at my church, and they all raved about it. Most of them have come to me and told me they've already made it for their families and they loved it as well! Not only is it absolutely delicious, but it is E-A-S-Y! I promise you won't be disappointed with this recipe! Here is the soup with some cheese on top! Yum!! Here is a ladel full of soup right out of the crock pot so you can see all the yumminess about it :). Put everything in your crock pot and cook for 3-4 hours on high or 7-8 hours on low. You can also make it on the stove, just let it boil softly until the onions are tender and the flavors have combined. Remove bay leaf and serve with cheese, sour cream, guacamole, avocado, tortilla chips, etc. This picture makes this dish look so-so...but it's one of the hubb's favorite!! I am horrible at taking decent pictures of food...oh well. You really need to try this one though, it is SOOOO good and, again, EASY! And I know some of the ingredients dont have exact measurements. Its just kind of a dump in kind of recipe that's really hard to mess up! Brown ground beef, onion and green pepper until meat is done. Add chili powder and cook 2 minutes. Add corn and salsa. Just dump some corn in and keep adding salsa until its all really moist (I'd guess about 2-3 cups of salsa). In an 8x8 or 9x9 square pan layer 1/4 of the meat mixture, sprinkle on some cheese, and add a tortilla. Add another 1/4 of the meat mixture, a little layer of sour cream, cheese, and tortilla. Then 1/4 of the meat, cheese, tortilla. Finish with the remain 1/4 meat. Cover with foil and bak 375 for 25 mintues (note: pan will be FULL but it's okay!). Remove from oven, sprinkle on cheese and bake another 5 minutes uncovered for cheese to melt. Note: When I layer on the tortilla, I usually trim it to be a square that will fit the pan and take the strips I cut off the round sides and layer them on with the tortilla. Hopefully that makes sense. If not, just layer on the tortilla :). Another note, my dad doesn't like sour cream, so I've left it out before with equally delicious results. Place chicken strips in a 9x13. Combine all sauce ingredients in a pan, and bring to simmer. Pour over chicken making sure all chicken has been coated in sauce. Bake on 350 for 35-45 minutes, or until chicken is done. Banana bread is a comfort food. And there are maybe half a million recipes out there for it. I can't say I've tried all of them, because I stopped at this one. It is the best banana bread I've ever tried. But you can certainly make it and decide for yourself. It's so flavorful and moist and definitely a keeper! Blend sugar and butter. Mix in eggs. Add in bananas, sour cream, milk and vanilla. Mix well. Mix in flour, baking soda and salt. Pour evenly in to 3 greased loaf pans. Bake 350 for 1 hour. I know this cake goes by all sorts of names, and regardless of what it is called, its just down right delicious. And easy. And did I mention delicious. Bake cake according to directions on box. While cake is warm (not hot!) poke holes all over with a butter knife. I actually kind of just make slash marks all over it. Pour sweetened condensed milk and carmel all over cake. I babysit it for a while making sure it soaks in evenly. Once cool, sprinkle half the bag of toffee bits on the cake. Then frost with cool whip and sprinkle the other half of the bag of bits on top. IF you have leftovers, make sure you keep them in the fridge! These are so easy, yummy, and kid-(husband) friendly! Defrost some Rhodes Rolls (normal size, not the jumbo kind). They don't really need to rise, just be defrosted all the way through. Take two and squish them together and flatten them out in your hand. I usually fill mine with shredded cheese and diced sandwich ham. We have also tried pizza sauce, cheese, and pepperoni. It is also really good to add veggies (onions, peppers, mushrooms, etc.) to these. (Cook the veggies a little first in a skillet.) Then just fold the dough around and pinch the bottom together. Place on a sprayed cookie sheet (spread apart, they grow!). Brush with a little melted butter and sprinkle with parmesan cheese. Bake 20-22 minutes on 350. This is a great recipe because everyone can make them with what they like in them (bar style), you can experiment with different ingredients, and they reheat well the next day as leftovers! Enjoy! !